Who says you need a lot of time and effort to make your bathroom shine? Professional cleaners Indianapolis share these tips for a quick touch up. You don’t need assistance from professional cleaners Indianapolis with shower head cleaning. Pour a single cup of vinegar and a single cup of water into a plastic bag. After that, put the plastic bag with the ingredients over the shower head, submerging it in the liquid, securing it with a twist-tie or a rubber band. Leave it alone for half an hour, take the bag off, and rinse by running hot water. Provided your holder is dishwasher-safe and is made of reactive metal or wood, pop it onto the top of the rack and select the normal cleaning cycle. If it’s made of plastic, you can soak it in mouthwash for a couple of minutes, scrub it with a pipe cleaner or a fine brush, and rinse in running water. 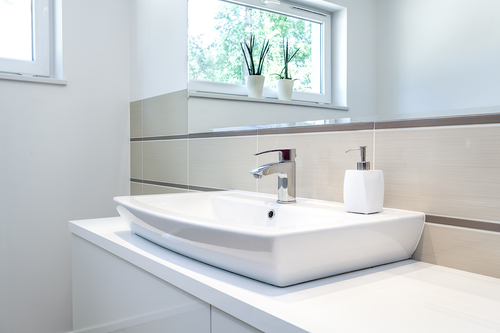 You can easily polish chrome faucets in the bathroom by applying shaving cream to the fixtures. Rub the shaving cream thoroughly, then wipe using a damp cloth. That should give your faucets a glistening finish. Bathroom mirrors tend to get dirty and fog up. Again, shaving cream is your friend. Rub the cream onto the mirror using a paper towel. After that, take a wet paper towel and clean the shaving cream off the mirror. The mirror will now be polished, won’t fog up for about a week, and will smell nice too. Do not try to wipe the mildew from the liner of the shower curtain. Toss it into the washing machine, and use regular detergent. You can also use half a cup of baking soda. Also, toss a couple of sheets of towels in there with the curtain. They will help rub it clean, while protecting the liner at the same time. After that, take it out of the machine, rehang it, and leave it to dry. Grout and moldy tiles seem impossible to clean without the help of professional cleaners Indianapolis, but it is far easier than it looks. Mix vinegar or bleach and water in equal parts, pour the mixture into a spray bottle, and spray the grout and moldy tiles. The key with this is to let the solution dry completely before rinsing. If there are some really persistent black spots, and there often are, make a paste out of water and baking soda. Mix them in a small cup, than use an old toothbrush to attack the mold. Alka Seltzer works magic with a clogged drain. Simply drop a couple of tablets in, let it fizz for about fifteen minutes, and then – a hot water flush. The easiest way to declog a drain. It’s Alka Seltzer time again! Two tablets, a fifteen-minute fizz, and a thorough rub down with the toilet scrub. Flush after brushing, and you’ll have a shiny new toilet bowl. DeluxeMaid boasts the best cleaning professionals in the business. Not only can they make your bathroom spick and span in a jiffy, but they can help out with all sorts of house business you don’t have time to tend to. Contact us today!